Nutella and protein balls? You’ve got my attention! Preparing healthy snacks to have when you’re on the go is the best way to ensure you have a quick supply of energy for when you’re in-between meals and to ensure you’re don’t fall for sweet temptations when you need a pick-me-up. By making your own protein balls, you are able to have a healthy, balanced snack minus the nasties, preservatives and the steep price tag of store bought protein balls – (which can be anywhere from $3.00-$6.00)! These Nutella Protein Balls provide a dose of healthy fats from coconut oil and chia seeds and the ‘rawtella’. Incorporating fats like coconut oil and chia seeds help keep you satiated as well as protect your heart and brain and help raise your levels of HDL (good cholesterol). They contain chia seeds, which are an amazing superfood boosts the fibre content of this delicious snack, which improves gut function and even helps you with balance estrogen levels in the body! 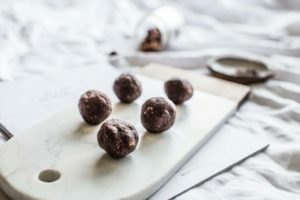 These Nutella Protein Balls tick all the boxes when it comes to what is important in a healthy snack: high in omega-3 fatty acids, great source of protein and full of fibre to help keep your gut regular. Incorporating fibre in these protein balls through chia seeds and LSA mix will ensure you stay fuller for longer as well as fuel for your good gut bacteria and stabilising blood sugar levels. Protein – the addition of plant protein powder ensures you meet your protein requirements for the day and keeps you fuller until your next meal. It is also perfect for providing amino acids and improve recovery post workout. You can use any flavour of protein powder such as vanilla but I recommend chocolate as it goes nicely with the chocolatey taste of the rawtella. Portion control: making your own protein balls is much healthier and cheaper than buying them, however it is still important to pay attention to portion control. Snacking on protein balls all day long isn’t going to help you achieve a lean body. Two of these babies is enough and will provide you with all the nutrients and brain power you need in between meals. To store these Nutella protein balls simply pop them in an airtight container and keep them in the fridge for up to 4 days. In a bowl combine all ingredients until you get a doughy consistency. Scoop out 1 tablespoonful of mixture at a time and roll into balls. Store in airtight container for up to 1 week.